Wednesday is the final night in the NBA regular season and, hoo boy, virtually nothing is settled. Heading into Game 82, one of the eight first-round matchups is locked in – that’s it. We know that the fourth-seeded Boston Celtics will meet the fifth-seeded Indiana Pacers in an Eastern Conference quarterfinal. Everything else remains wide open. I have been tasked with the unpleasant business of explaining how everything might play out with a variety of tiebreakers in play and the different permutations of playoff matchups that can arise depending on what happens on this final evening of regular-season action. It also just so happens that seven – count ‘em, seven! – of the 11 matchups on the last day of the league calendar are LIVE on TSN. As such, TSN.ca will once again break out the Multiplex so you can watch up to four games at once, eliminating your need to keep flipping channels or checking scores on your phone. Alright, pour yourself something stiff and follow along as I attempt to break down all of the potential scenarios in play. Alright, first things first, it might be easiest to tell you what we already know. In the West, all eight playoff spots are clinched and certain seedings are already locked in, but after that, there's not much. The East is, at once, more settled and less certain with the top five seeds spoken for, but the final three playoff spots remain up for grabs. That’s, uh, not a lot. With so much to play for, let’s try to break it down through the easiest paths first. Charlotte Hornets – Potential Positions: No. 8/Out of the playoffs – It’s very simple for Kemba Walker and Co. – they need to beat the Orlando Magic at home and hope that the moribund New York Knicks beat the Detroit Pistons to claim the eighth spot and a date with the Greek Freak and the Milwaukee Bucks. The Hornets are 2-1 against the Magic this season and all three games were blowouts, with the smallest margin of victory being 25. While the Pistons are playing a Knicks team that has nothing at all to play for (except for pride and maybe not even that), the Hornets won’t have such luck. This is a big game for the Magic, too – more on that later. You can catch the Orlando Magic vs. Charlotte Hornets LIVE at 8 p.m. ET/5 p.m. ET on TSN3, on TSN Direct and streaming on TSN.ca. Detroit Pistons – Potential Positions: No. 7/No. 8/Out of the playoffs – Most pressing for the Pistons on Wednesday night is winning. Right now, Dwane Casey’s team couldn’t care less about matchups because there’s still a chance they’re not even going to the postseason. A loss coupled with a Hornets win and the Pistons are out of the playoffs for the ninth time in 10 seasons. Luckily, they’re up against a Knicks team that has won just nine games at home and is coming into the second half of a back-to-back. The Pistons can still finish as high as seventh. A win against the Knicks, coupled with a Magic win, will lock up a date with Casey’s former team in the Toronto Raptors – a club against which the Pistons have had a great deal of success this season. In terms of playoff storylines, a Pistons-Raptors matchup would be a terrific one. The Pistons can still back into the playoffs with a loss, provided that the Hornets also lose. Orlando Magic – Potential Positions: No. 6/No. 7/No. 8 – Steve Clifford has the Magic back in the playoffs for the first time in seven years and that’s the big thing, but the team can help control its own playoff destiny on Wednesday with a win against the Hornets. First, the worst-case scenario: the Magic can finish in eighth if they lose to the Hornets, the Pistons beat the Knicks and the Brooklyn Nets top the Miami Heat. Fortunately, this is the scenario with the most contingencies and the least likely. What about the seventh seed? If the Nets win, they clinch sixth. So if Brooklyn is victorious and the Magic win, it’s a date with the Raptors for the Magic. The Magic can also finish seventh with a loss to the Hornets coupled with a Knicks’ defeat of the Pistons. Okay, so how about the sixth seed? The Magic will finish sixth if they beat the Hornets and the Nets fall to the Heat. They can also finish sixth if they lose to the Hornets, the Nets lose to the Heat and the Pistons beat the Knicks. Brooklyn Nets – Potential Positions: No. 6/No. 7 – This one is fairly straightforward: If the Nets can beat the Heat they lock up sixth and a series with the 76ers. They can also finish sixth with a loss to the Heat coupled with a Magic loss to the Hornets and a Knicks win over the Pistons. Seventh for the Nets is also a possibility, but this is only in play should they lose to the Heat. If Brooklyn falls to Miami and the Magic beat the Hornets, it’s seventh place for the Nets and a date with the Raptors and president Masai Ujiri, who has been to known to occasionally make his opinion of Brooklyn known publicly. You can catch the Miami Heat vs. Brooklyn Nets LIVE at 8 p.m. ET/5 p.m. PT on TSN2, on TSN Demand and streaming on TSN.ca. Los Angeles Clippers – Potential Positions: No. 7/No. 8 – Doc Rivers has done an amazing job to even get this Clippers team – led by super sixth man Lou Williams and Hamilton, Ont., rookie Shai Gilgeous-Alexander – into the playoffs, so they might feel like everything is gravy right now. But they still would do well to avoid the juggernaut Warriors in the first round to prolong their postseason. The easiest scenario for the Clippers is the one they want to avoid most – any loss to the Utah Jazz on Wednesday and they get locked into eighth and date with the Dubs. Even if they were to beat the Jazz, they would still finish in eighth if the San Antonio Spurs defeat the Dallas Mavericks. To finish seventh, the Clippers require help, but that all starts with the beating the Jazz. A win over Utah plus the Milwaukee Bucks defeating the Oklahoma City Thunder or the Mavs topping the Spurs would give the seventh seed to the Clippers. San Antonio Spurs – Potential Positions: No. 6/No. 7/No. 8 – The remarkable Gregg Popovich extended his playoff streak to 22 years, the longest such run in pro sports, and can run into his old charge Steve Kerr and the Warriors in the first round. The path to a matchup with the Dubs is a simple one: the Spurs will finish with the eighth seed if they lose to the Mavs and the Clippers top the Jazz. The seventh seed will belong to the Spurs with a win over the Mavs and the Thunder managing to beat the Bucks. San Antonio can also finish seventh should they lose to the Mavs and the Jazz top the Clippers. In order to finish sixth, the Spurs must beat the Mavs and hope that the Bucks take out the Thunder. 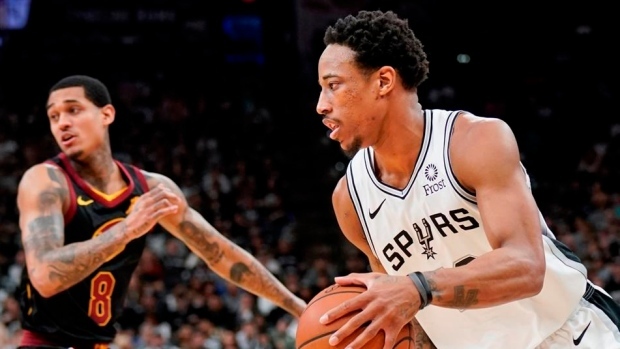 You can catch the Dallas Mavericks vs. San Antonio Spurs LIVE at 8 p.m. ET/5 p.m. PT on TSN1, on TSN Direct and streaming on TSN.ca. Oklahoma City Thunder – Potential Positions: No. 6/No. 7/No. 8 – Fans might be salivating at the prospect of a seven-game series between Kevin Durant and his old team, but the Thunder probably aren’t and will want to avoid that final seed. Fortuitously, there is only one scenario in which that can happen: The Thunder must lose to Bucks, while the Spurs beat the Mavs and the Clippers down the Jazz. Just as there is one scenario in which the Thunder can finish eighth, Billy Donovan’s team can only finish seventh in a single context: It’s the seventh seed for OKC should they lose to the Bucks, the Spurs dump the Mavs and the Jazz top the Clippers. The sixth seed is the most likely destination for Russell Westbrook, Paul George and the rest of the Thunder. Beat the Bucks and it’s theirs. OKC can also claim the sixth seed should they lose Milwaukee and the Spurs fall to the Mavs. You can catch the Oklahoma City Thunder vs. Milwaukee Bucks LIVE at 8 p.m. ET/5 p.m. PT on TSN4, on TSN Direct and streaming on TSN.ca. Portland Trail Blazers – Potential Positions: No. 3/ No. 4 – The big difference between the jockeying for positions at the bottom half of the East and the top half of the West is that all of the relevant parties are in action in the East, while the Houston Rockets are spectators on Wednesday and will have their fates determined by what happens in the two other key matchups. One of those is the Blazers entertaining the Sacramento Kings. Led by the dynamic backcourt duo of Damian Lillard and the returning C.J. McCollum, the Blazers have reached the postseason for sixth season in a row and will have home-court advantage in the first round, despite being written off before the season started. Locking up their seeding isn’t complicated for Portland and it could have nothing to do with their own actions: if the Nuggets beat the Timberwolves, the Blazers are the fourth seed and will play Utah. They can also finish fourth if the Nuggets lose to Minnesota and they fall to the Kings. It’s third seed for the Blazers if they can top the Kings and the Nuggets fall to the T-Wolves. Though, putting any faith in getting help from a Minnesota team in the second half of a back-to-back coming off of a drubbing by the Raptors might be unwise. You can catch the Sacramento Kings vs. Portland Trail Blazers LIVE at 10:30 p.m. ET/7:30 p.m. PT on TSN1, on TSN Direct and streaming on TSN.ca. Houston Rockets – Potential Positions: No. 2/No. 3/No. 4 – As mentioned above, the Rockets are idle tonight and will be glued to their TV sets to watch what unfolds with the Blazers and Nuggets. The Rockets will earn themselves a date with the Jazz through the fourth seed should both the Blazers beat the Kings and the Nuggets beat the T-Wolves. It’s the third seed for Houston if the Kings can beat Portland and the Nuggets are victorious over the Timberwolves. But the outcome the Rockets are rooting for most is the unlikely scenario of a tired T-Wolves team topping the Nuggets on the road. Were that to happen, Houston would find themselves with the second seed. Denver Nuggets – Potential Positions: No. 2/No. 3 – Regardless of what happens on Wednesday, Mike Malone has done a masterful job with the Nuggets as Jamal Murray has emerged into a legit star and Nikola Jokic will undoubtedly receive MVP votes in his breakout season. Wednesday night is fairly simple proposition for the Nuggets and their fate is in their own hands. Beating the T-Wolves will result in the Nuggets claiming the second seed in the West. Should they fall to Minnesota, they will finish with the third seed and the Rockets jump up to No. 2. In what portends to be a complicated evening, I appreciate the clarity of this one.